96Boards Neonkey board is based on the STMicroelectronics STM32F411CE Cortex M4 CPU. Zephyr applications use the 96b_neonkey configuration to run on these boards. 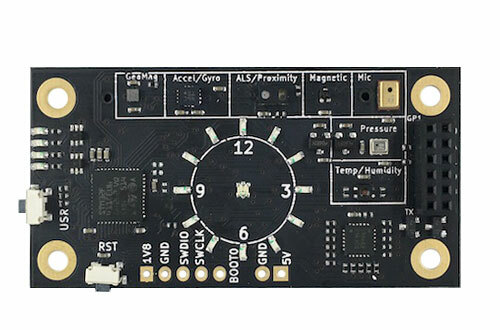 This board acts as a sensor hub platform for all 96Boards compliant family products. It can also be used as a standalone board. 96Boards Neonkey can be driven by an internal oscillator as well as the main PLL clock. By default System clock is sourced by PLL clock at 84MHz, driven by internal oscillator. On 96Boards Neonkey Zephyr console output is assigned to USART1. Default settings are 115200 8N1. Here is an example for building the Hello World application. 96Boards Neonkey can be flashed by two methods, one using the ROM bootloader and another using the SWD debug port (which requires additional hardware). More detailed information on activating the ROM bootloader can be found in Chapter 29 of Application note AN2606. The ROM bootloader supports flashing via UART, I2C and SPI protocols. The above command assumes that Neonkey board is connected to serial port /dev/ttyS0. For flashing via SWD debug port, 0.1” male header must be soldered at P4 header available at the bottom of the board, near RST button. Use the Black Magic Debug Probe as an SWD programmer, which can be connected to the P4 header using its flying leads and its 20 Pin JTAG Adapter Board Kit. When plugged into your host PC, the Black Magic Debug Probe enumerates as a USB serial device as documented on its Getting started page. After flashing 96Boards Neonkey, it can be debugged using the same GDB instance. To reattach, just follow the same steps above, till “attach 1”. You can then debug as usual with GDB. In particular, type “run” at the GDB prompt to restart the program you’ve flashed.